I'll preface this post by saying that I usually don't like cakes that look like random objects, and the recent trend of videos put out by the major cooking channels on social media of cakes that look like avocados, pineapples, golf balls, Christmas trees, etc, just don't look very appetizing to me, and are downright painful to watch when executed poorly. 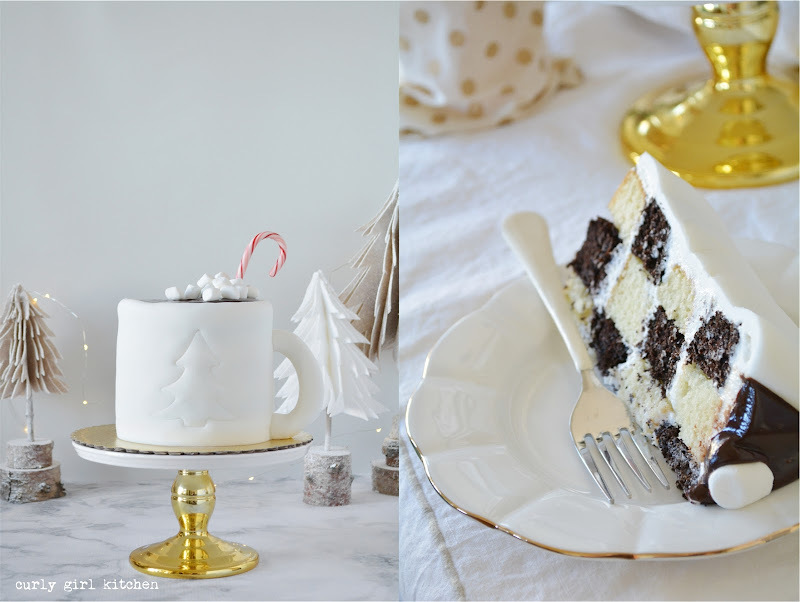 As a cake maker and decorator, I certainly appreciate the skill and creativity that goes into the ones that are done well, but in the end, I'd still far prefer to have a cake that looks like a cake, and tastes as amazing as it is pretty to look at. 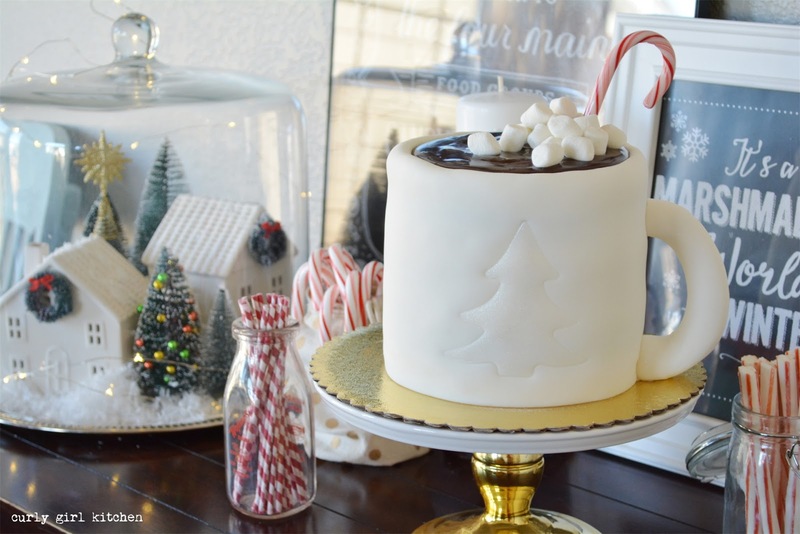 So I realize I'm a little hypocritical to say all of this and then make a cake that looks like a cup of hot chocolate, but I'm okay with that, because this cake does taste as delicious as it is beautiful. 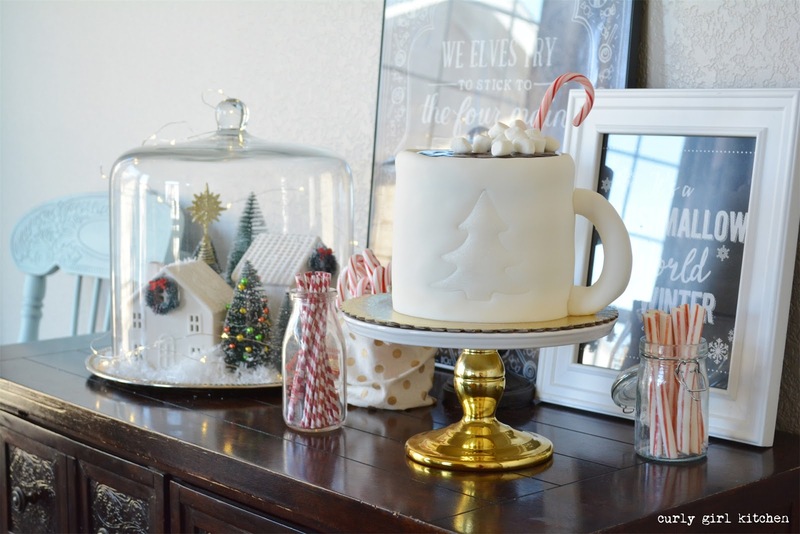 It began with a customer's order for two birthday cakes, one chocolate and one vanilla. They were smaller cakes, but rather than just mix up a half-recipe of each, I made the full recipes, baked the extra batter into 6-inch cakes, and froze the cakes for a rainy day. 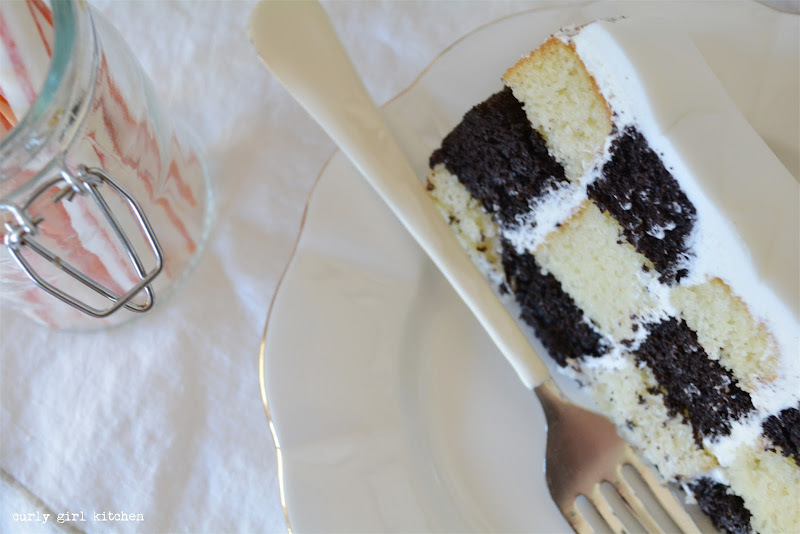 With two layers of vanilla and two layers of chocolate tucked away in the freezer, I realized it was the perfect chance to try something I've been wanting to do for years, a checkerboard cake. And what a pretty surprise it is for guests when you cut into the cake! I know some bakers who have a strict no-fondant rule, and it's not something I use much myself, other than for a little decoration here and there, so you will rarely see a design from me for a fondant-covered cake. In fact, I've only ever covered a cake in fondant once, this BMW cake for my husband's 40th birthday a few years ago. And if you have really superb skills at smoothing out buttercream, you could certainly try this design without the fondant, but I felt like it was necessary to get the look I wanted. 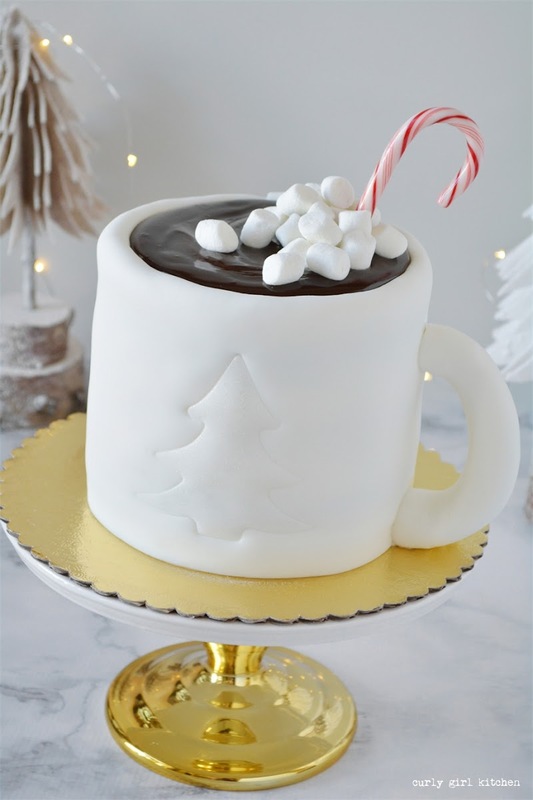 Just the sides of the cake are wrapped in fondant, with dark chocolate ganache spooned on top and sprinkled with marshmallows. 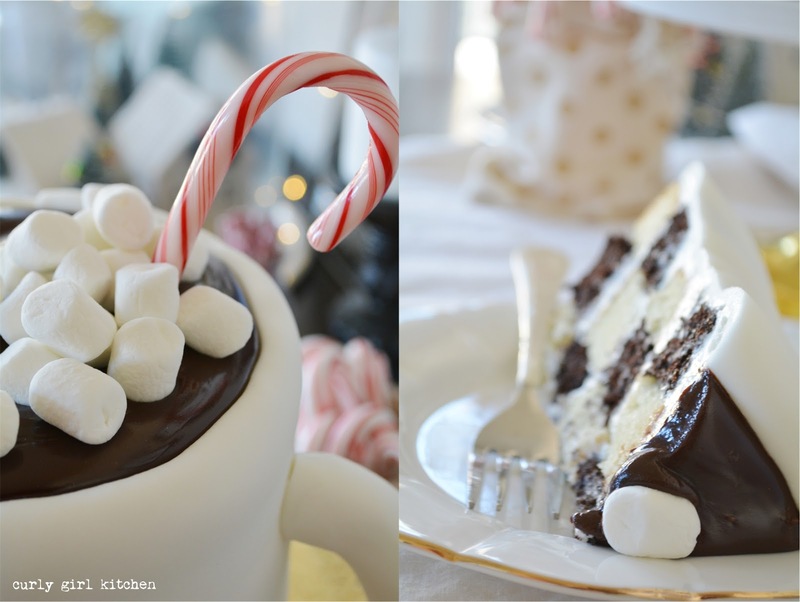 And what cup of hot chocolate at Christmas is complete without a candy cane? We spent this past weekend putting up all our Christmas decorations, and our 14-month old just loved all the activity and wanted to help with everything. Of course, he is especially intrigued by the tree, and we had to hang most of the ornaments out of his reach, as he wants nothing more than to pull them off the tree to play with them. Snowman Eggnog - (no link) Just melt some chocolate, use a paintbrush to paint the inside of a glass, chill, and then fill with eggnog! 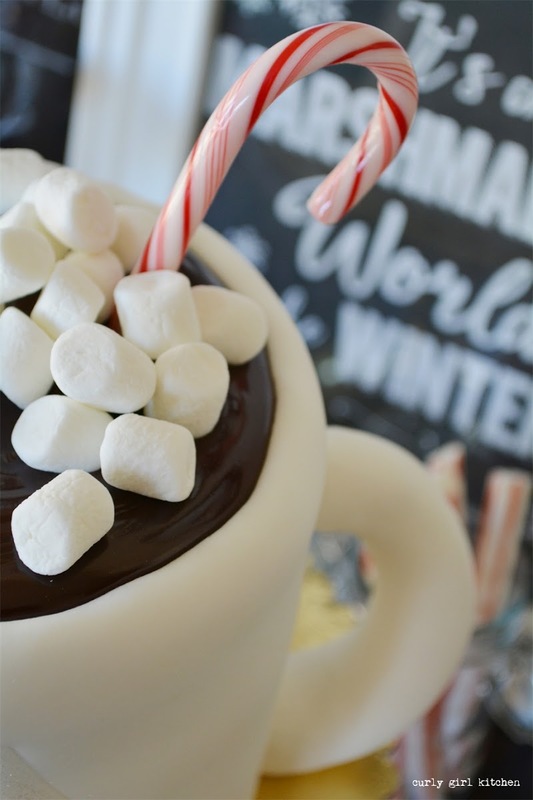 Chocolate Dipped Marshmallows - (no link) Insert a mini candy cane into marshmallows, and dip in melted chocolate. Serve with hot chocolate! 1. 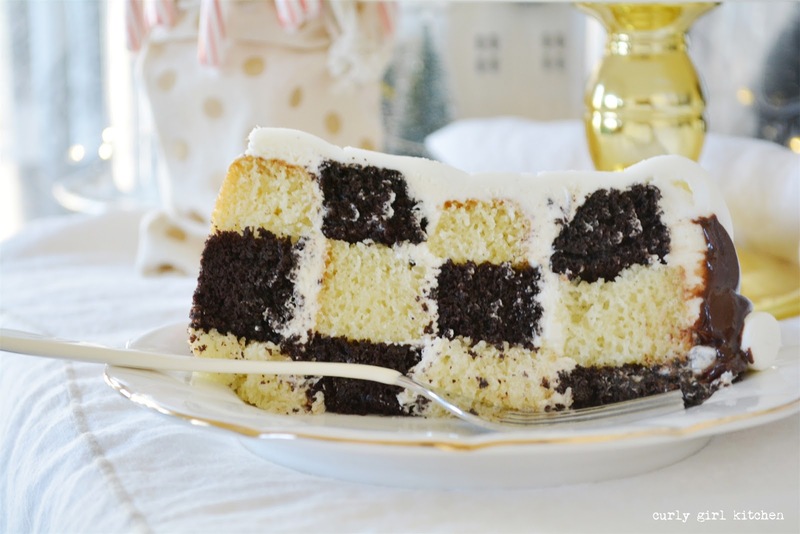 To assemble the cakes in the checkerboard design, make sure all the cakes are leveled to the same height. 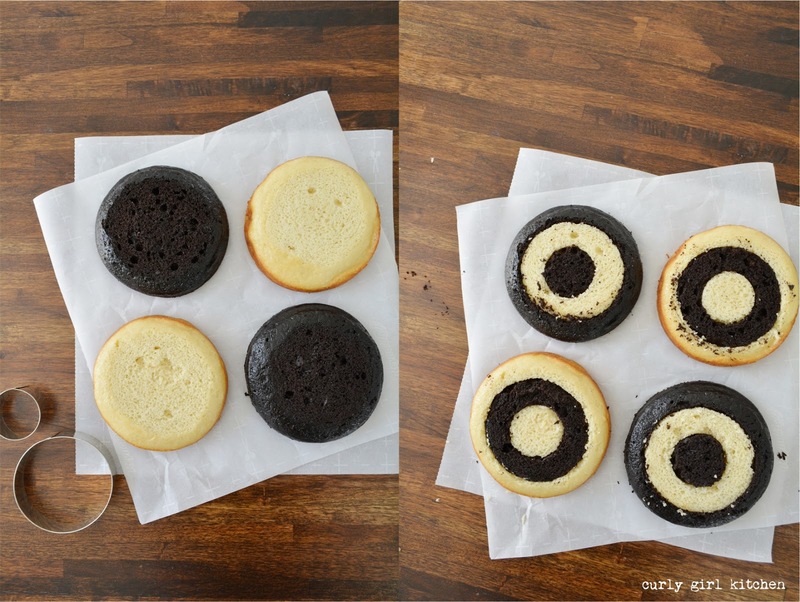 For 6-inch cakes, you can cut three rings, and for 8-inch cakes you can cut four rings. For the six-inch cakes I did, I used a 2-inch round cutter and a 4-inch round cutter to cut the rings in the cake. Then, carefully rearrange the rings as pictured. 2. 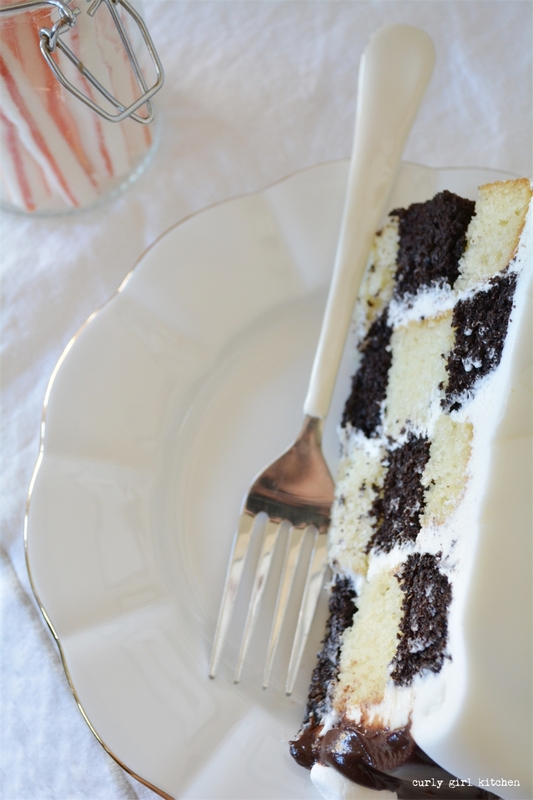 As you stack and fill the cakes with buttercream, alternate so that they are stacked chocolate, vanilla, chocolate, vanilla, to complete the checkerboard pattern inside. Frost all over with the buttercream and smooth it out. Chill for about 15 minutes while you roll out the fondant. 3. 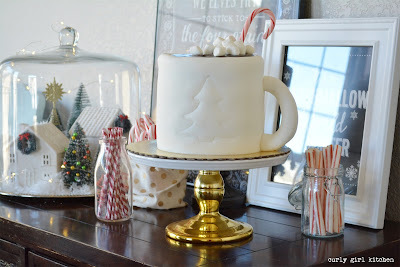 Measure the height and circumference of your cake. You'll need to roll out the fondant so that it is about 1 inch taller than your cake, and overlaps the circumference by about 1/2 inch. Lightly dust your counter with powdered sugar and roll the fondant out to about 1/8 inch thick. 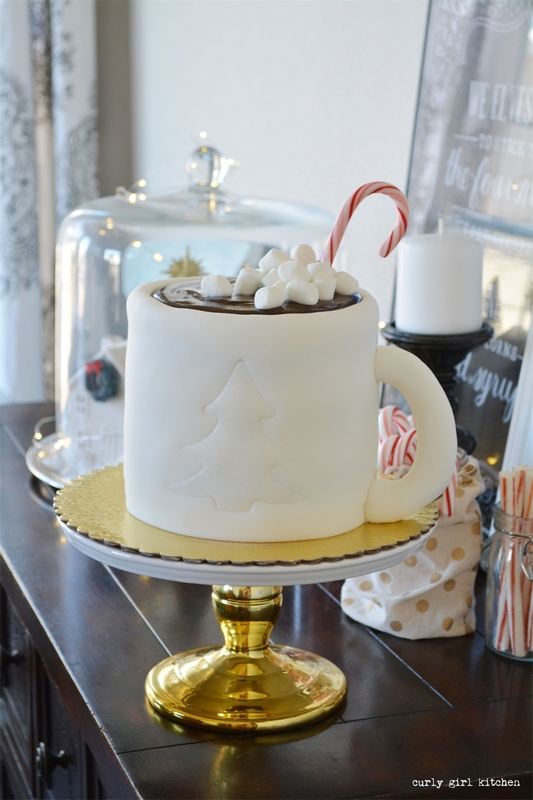 Use a pastry cutter to trim the fondant into a rectangle measuring the dimensions needed to wrap around your cake. 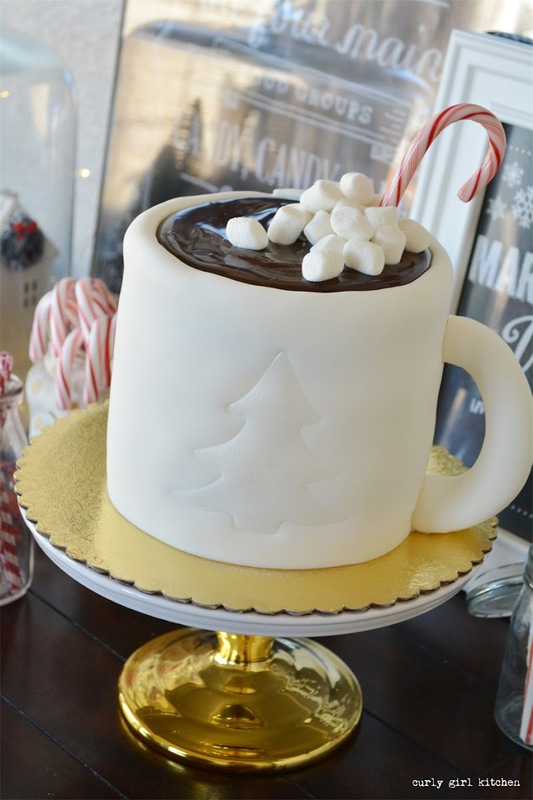 Carefully lift the fondant and wrap around the sides of the cake, then fold over the top edge towards the inside to form the lip of the "cup", which you will later fill with ganache. Use a fondant smoother to smooth everything out. If you like, use a cookie cutter like I did to press a little impression onto the front of the cake to make your cup design. 4. For the handle, I formed mine out of just fondant, but it was really far too heavy. It would be better to form it out of a rice crispy treat, then cover that with a thin layer of fondant. Insert wooden sticks into each end of the handle, then insert those into the cake to secure the handle to the cake. Dab on a few drops of vodka or water to seal the handle against the cake. 5. To make the ganache, warm the cream just until it simmers. Remove from the heat and stir in the chocolate until smooth. Spoon onto the top of the cake. 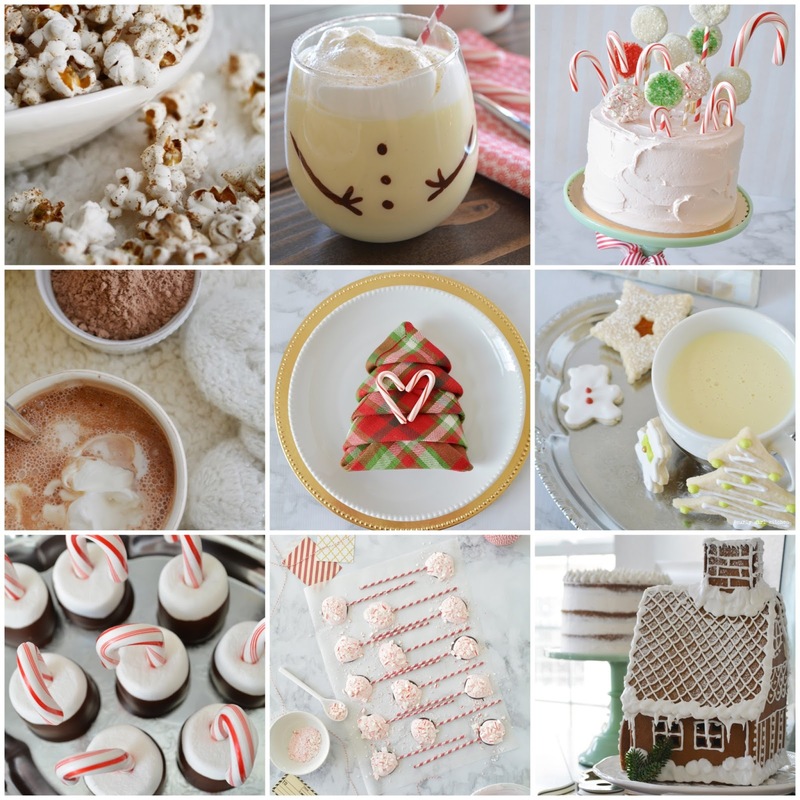 Sprinkle with marshmallows and finish with a candy cane garnish.